In contrast to Jerez, where the primary goal was to have the car turn laps, for the first Bahrain test series, it’s more difficult to draw thoughtful conclusions from the data as the teams will have a variety of tasks and goals on which they’re focused, such as chassis work (aero and suspension), power units (endurance, fuel efficiency, power, systems integration), and tyre work (endurance, wear, degradation). As expected the big Renault teams (Red Bull, Toro Rosso and Lotus) continued their trend of unreliability however Red Bull did turn in a quick lap before they were forced to stop again. In his book Collapse, Jared Diamond holds up the colony of Greenland as an example of what can go wrong when humanity, which operates on a very rapid timescale, gets fooled by geological time, which moves much more slowly. For those of you who don’t know the story, the discovery of Greenland happened at the warmest time by far of the Medieval period, and that warmth was not only enough to sustain agriculture of the European sort, but persisted for over 100 years, enough to fool the colonists into thinking it would come back. It didn’t of course, and their end was written with savagery and tragedy that is worth holding up as a mirror to these modern times. Red Bull spent the morning hours inside the garage with cutting and grinding sounds originating from behind their barriers. Watching Red Bull struggle with the Renault power plant in a repressive society whose protests fill the #F1 Twitter feed, we are reminded of how F1 is still emerging from a golden period of unlimited sponsorship and TV money, and how that has kept the teams and the sport from having to come to terms with the inevitable and how the chaos in Red Bull is just an example of the FIA and FOM being at cross purposes in terms of trying to increase viewership versus increase revenue. The thought that really sticks from reading Collapse is that when a society’s leaders interests diverge significantly from its members, that society is headed towards failure. Mercedes look very good, with Hamilton running a race stint of 18 laps right around 1:40 and finishing his day early with 74 laps. 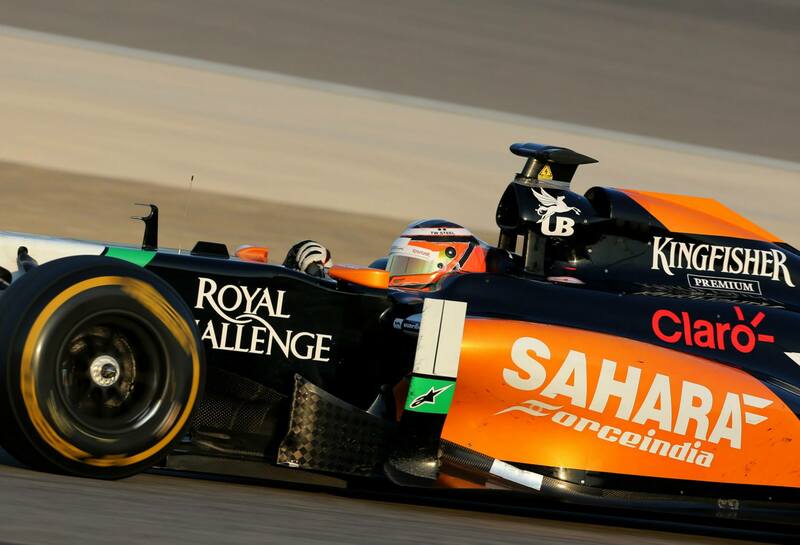 Force India, in the hands of Hulkenberg topped the timesheets with a 1:36:880 while Adrian Sutil showed the Sauber is very reliable running the most laps – 82, beating McLaren by 1 lap! Ferrari had a mostly uneventful day although they had a scare first thing with Alonso having to rush back to the pits with smoke pouring out of the back of his Ferrari. After a ‘fuel mix’ issue was identified and fixed he rejoined the track and managed to complete 64 laps. Did Boullier know how bad the Renault engine was? Lotus had a number of problems however are confident it is software and battery related and can be fixed quickly. It is strange that none of these problems happened during their filming day or is this linking into Remi Taffin’s (Renault Head of Track Operations) statement 4 days ago that Renault are struggling to get the various systems talking to each other in the right way and have to prioritise? Speaking at the end of the day, Taffin is confident the engineers have made good progress. Under the table you say? Does that mean you are hiding it from the teams/public or is this metaphorical “water under the bridge”? This leads us on nicely to the green monster from Leafield. 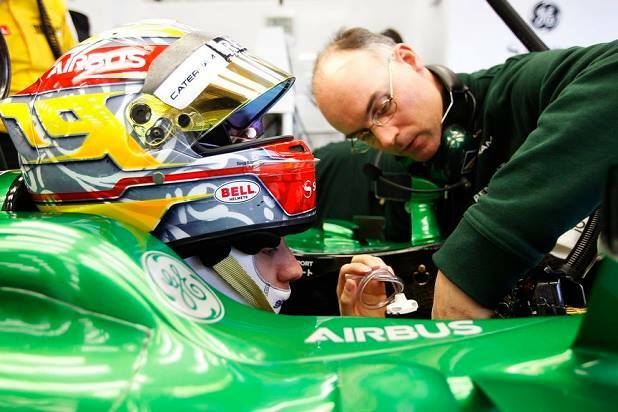 Test driver Robin Frijns did his part for Caterham and Renault by running 68 laps. Perhaps Newey should go and have a look at what they are doing to make the Renault last. The battle that everyone is really looking towards is of course the one between Caterham and Marussia. This has now become a death match after Fernandes’ speech has Caterham employees quietly looking for work in McLaren’s road car division. Unfortunately Marussia were MIA, an IT configuration problem confined their car to the garage for most of the day, so we still have no baseline to properly compare them with (ignoring Jerez). Williams had a trying day as well with a fuel system problem. Rod Nelson (Chief Test & Support Engineer) said after they replaced some components it became necessary to remove the power unit to investigate the fuel cell. Although they got some laps in at the end of the day this is not the start they were looking for in Bahrain. Caterham has covered 704km, the most of any of the Renault teams. Let us see what tomorrow brings us. Will Renault be able to solve enough of their problems to allow their teams to get some running or will we see Vettel pack his bags and go home early again? Is Williams experimenting with a Ferrari-like fuel cut system? All the engines have a fuel cut system. And it’s not a Ferrari idea. True, but was it done before in F1? As far as I know Ferrari is the only team using it this season. From what I understand they developed it in combination with Magnetti Marelli’s 500 bar direct injection. Remi Taffin – Renault’s Head of Track Operations – said in his Q & A with Ted Kravits on Sky that they were using it. So I doubt Mercedes aren’t using it. Especially as it’s been used in other motorsports like WEC, WRC, etc. for decades. And Magnetti Marelli are just one of many fuel injection suppliers. And ALL the engine manufacturers are running 500 bar injection pressures – as that’s what the rules proscribe. Ah I see, thank you ! I thought Magnetti Marelli was the first to reach the 500 bar injection mark, and that Bosch (Renault/Mercedes) had some work to do reach that same limit. the 500 bar is a limit. Race engines ( like WEC ) can easily run at even higher pressures than that. Thank You Matt & Vortex fora great article. But the technology was invented in 1902. So maybe Mercedes might have ? They had a lot of experience with it in aero engines. The main point is that it is now mandatory – whereas before it was optional. The Mercedes is a little too reliable for my liking,reliable at this stage of the season with such a massive change in regulations means slow to me. Maybe im wrong but i hope they havent been to conservative. They have been working hard on that engine Nick. And trust me, they were struggling with the same problems Renault are having at the moment.. This was early December so give Renault a couple of weeks and they’ll have a reliable engine too.. But Renault DIDN’T have any problems …..
… until they put their engines in a car ! No problems showed up on the dyno. So I doubt Mercedes had these problems in December. TBH – I’m sure all the manufacturers have had loads of problems over the last few years developing these engines. But – as The Judge pointed out from Jerez – Renault went there expecting everything to run as smoothly as the Mercedes & Ferrari engined cars. But it didn’t – their engine was FUBAR ! By the looks of things, Ferrari and Mercedes have done a better job at getting the Power Trains ready for testing and running relatively smoothly. If there are problems they’ll likely show up in the final test when they start to move towards a race spec package and start to push things more. I’d rather be in a position of having pounded around the track to clock up the miles and discover the intricacy’s of the power train, rather than being bogged down with software issues, packaging problems and components not working properly. As I reported from Jerez, the Renault problems are a 15-20 week fix. I know, but the cynic in me thinks Renault are just spinning things to fend off crisis headlines etc But who really knows apart from Renault’s engineers. Red Bull is the more interesting aspect in all of this, it sounds like Newey’s been allowed to run wild on the design (nearly always a bad idea) and his apparent disdain for the new regulations might be at the root of their current woes. Plus piling development on the RB9 did not help. Tatical boo boo from Horner and co on that one. Anyway if Red Bull can’t at least manage a race distance run without breaking down or diving into the pits during what’s left of testing, the first race down under is going to be quite interesting. The new regs have allowed Ade to pull a mystery card on his superiors who could but trust him to deliver as he has for the past 4 years…. How many laps for the recovery truck? with the average f1 race lasting about 1 1/2 hours this will mean the average fuel flow rate will be around 65kg p/h.can anyone give any insight as to what the projected horsepower will be at that fuel flow rate not accounting for any of the electric motors? Thanks for that link,its interesting what it says about stoichiometric mixtures,gets me thinking as to why the reason is the renault has a larger cooling requirement and if that will translate in to more revs and power. Also,when they talk about the engines making 600bhp is that at the maximum fuel flow rate of 100kg p/h? Its going to be fascinating to see how they manage a race like Monza where u are on full throttle most of the lap,the difference between a qualy lap and a race lap will be like night and day.Setting up the car for both will be a huge compromise. 600 bhp was just a conservative guess. How much they will produce is a secret – but someone posted here on TJ13 that Mercedes were talking about 750+ bhp ( sorry can’t remember who ? ). He told thet the stop was caused by a brake issue, so the lock up wasn’t his fault (probaby). Could be the ERS-K brake by wire that caused it? That was my thought when I first saw the pics. We know Renault has problems with ERS anyway, and balancing the brakes to make them linear must be even more of a challenge if you can’t properly use the ERS sytem but your computer is still accounting for it. 2 new F1 teams for 2015 – one with Honda power – one with Ford power ! ” So those Honda rumours are compelling, as are those with Ford and Cosworth, but the FIA only opened one grid slot right? well perhaps not. Formula 1 actually has two spare slots on the grid, the one that USF1 was supposed to fill never got filled, and since then HRT collapsed, leaving two empty slots on the grid. Dear Mr. Marchionne and Elkann, If I can just get this for my birthday, I’ll never ask for anything else ever again! Alfa Romeo, I need it, I want it! It seems they have somewhere between 750-800 bhp including the electric systems from what ive heard,and they make 3 times the torque of last year which i heard ross brawn say was about 350nm for the v8’s. So 800bhp+ and 1000nm of torque should make for some seriously quick qualifying cars but in the races power will be severely fuel limited. Thats my take on it so far anyway,correct me if im wrong. Some circuits are likely to be severely fuel limited (eg Spa; Hungary ? ), some not at all (eg Monaco), and most somewhere in between. Anyone know where to find a list of estimated fuel use per circuit from the last couple of years – would be a useful guide, although you’d need to take into account the nature of braking zones (Monza, for example has lots of full throttle, but also lots of heavy braking / energy recovery).